Like I said, I haven’t read any of the issues of X-Factor prior to this relaunch. I wasn’t really into comics up until about two years ago, and since then I’ve pretty much been immersing myself in DC all the way. And I kind of needed a new X-Men team to read about since the current books aren’t doing much for me to keep me really interested in them, except maybe Wolverine and the X-Men but that’s ending (and apparently getting relaunched?). Hence one of the reasons why I’ve picked up All-New X-Factor this month. The first issue was disappointing, but the second issue seems to have picked up. After all the setup of the first issue, we are finally getting into the meat of the story. Of course, it doesn’t quite help that this first arc of the new series ends here. And abruptly at that. We had barely gotten introduced to a villain before he is taken out, rather explosively. I liked Gambit and Quicksilver in this issue. We got some interesting backstory for the latter and that gave me a new outlook on him, since all that I know about him is that he used to be an Avenger prior to this series and that he is also Magneto’s son. Together, the two of them provide some really good moments in this issue, and they are a highlight. The new villain proves to be somewhat lackluster. It is the sort of done-and-done characterisation that I lament seeing in comics, since it prevents the characters from developing. And that’s one of the big negatives of this issue. I wanted to know more about him and his motivations before we got done with him. But, we have what we have. Another positive thing was that we saw some new characters, and they have some bad history with Quicksilver, so that provided quite a bit of drama for the issue. And despite the ending of that particular subplot here, I have a feeling that we are going to be seeing them again at some point, and I’m totally fine with that. I’d love to see them again. They get brief cameos at best, and given their history with Quicksilver, I’d love to see somewhat of a long-term plan in place for them. The art is slightly better than last time, as I said. There is the negative that some of the characters just flow into each other visually as far as their faces are concerned, and this sets up a lot of confusion, especially when the action really gets going. Another thing was that there was an over-reliance on yellow for the colour palette throughout the issue, and in the second half with the villain making his big entry, things get really bright, almost so that they hurt. But, all the same, the art is pretty detailed and Giandomenico has a good sense of story pacing and flow. And overall, colourist Lee Loughridge does so some good work, especially with scenes involving Quicksilver. 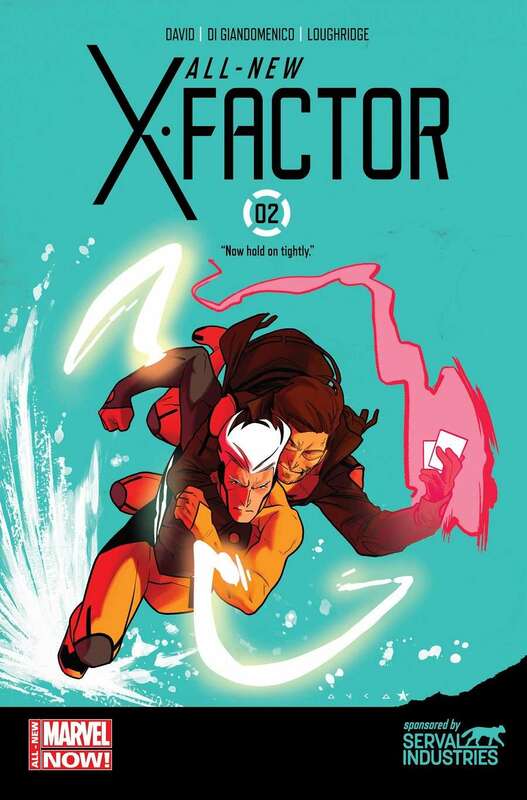 I’m kind of really looking forward to All-New X-Factor #3 now, so February should be interesting. Posted on January 27, 2014, in Comics Reviews, Review Central and tagged All-New Marvel NOW!, All-New X-Factor, Bane of Kings, Carmine Di Giandomenico, Comics, Comics Review, Gambit, Lee Loughridge, Marvel, Marvel Comics, Marvel Now, Peter David, Polaris, Quicksilver, Review, Science Fiction, Serval Industries, Superheroes, Urban SF, Wolverine, X-Factor, X-Men. Bookmark the permalink. 1 Comment.